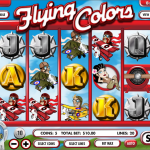 Developed in 2010 by Rival, Flying Colors is the perfect game for all you aviation lovers. It takes place in a clear blue skies background and involves some of the best flying machines in history. The graphics are a bit cartoon like but what a perfect day to be up in the air! 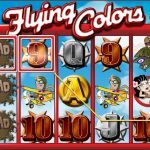 The reel symbols on the Flying Colors slot game include the scattered Propeller, the wild Zeppelin, the Crimson Kaisers Bonus symbol. There are other symbols such as the bold letters and numbers that represent high value playing cards. 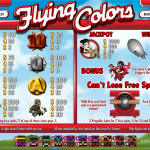 Flying Colors has several bonus features you will surely like! For starters you have the scatter which is the Propeller symbol. When you land 3, 4 or 5 of each you get 7, 14 and 25 free spins. Oh and there’s also a multiplier of 2x. Another scatter is the Crimson kaiser symbol. When you land 3 or more on an active payline you trigger the bonus round. In this round you get to play in an airplane dog fight round!. You simply aim your guns and shoot down your enemies. How aewsome is that!! The wild symbol is the Zeppelin symbol which substitutes any other symbol except the scatter to complete a winning combination. Love Bongo and Slots? Try playing 5 Reel Bingo a 5 reel Bingo slot by Rival.